The Chinese really knows who calls the shots around the world, and it's obviously the tight-rope walking hippies, clowns and unicyclists. 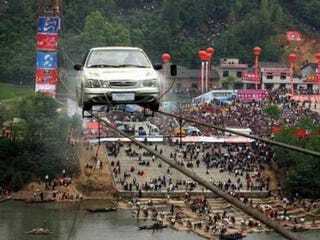 Liu Suozhu, better known as the Car King, managed to drive what appears to be some kind of a Chinese Sentra knock-off across 750 feet of steel wire while thousands of spectators watched. You know the only reason people goto air shows is to see a crash—this is kind of the same thing, but the Chinese crowd of thousands left the event disappointed as Suozhu didn't plummet to his death. It took Suozhu 30 minutes to complete the journey and he provided his own color commentary during the entire trip over a loudspeaker to the crowd. [Ananova via Neatorama].